I have some friends that directed me to some screenshots they took with ReShade on WoW. I thought that this was really cool, so I tried to install ReShade 1.1.0 and make it work with WoW. As far as I can tell, I have everything properly set up in Mediator. 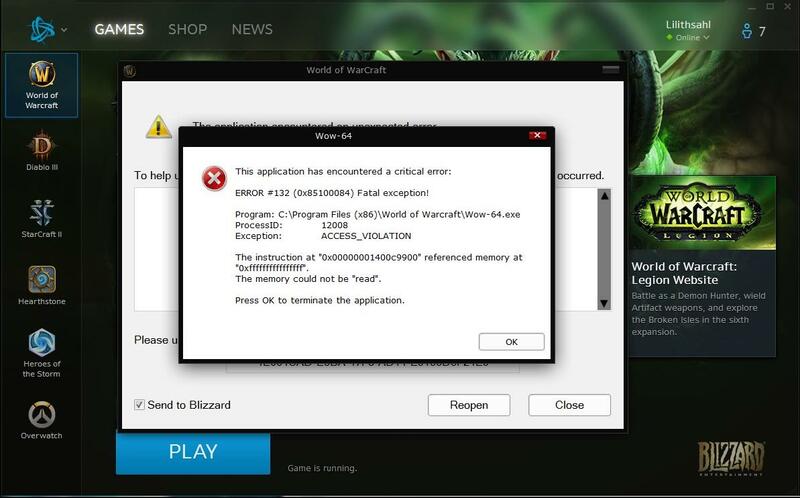 But every time I try to launch WoW with Mediator running, this error occurs and WoW crashes. If I can get any kind of help at all, that'd be amazing. I really am lost when it comes to this. 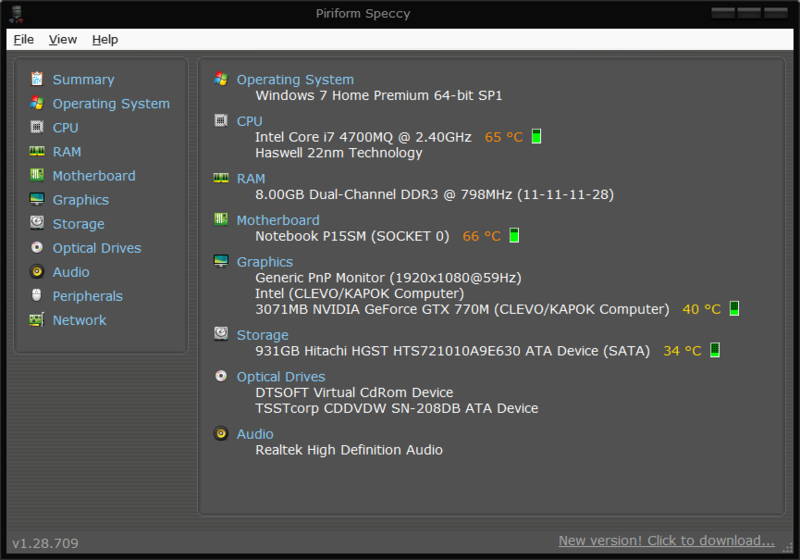 Any thid-party software like game overlays, screen recorders, streaming tools, game boosters or similar running (Dxtory, Razer Synapse for example)? What does the ReShade log say (d3d9.log file in your WOW folder)? Last Edit: 3 years 3 months ago by crosire. 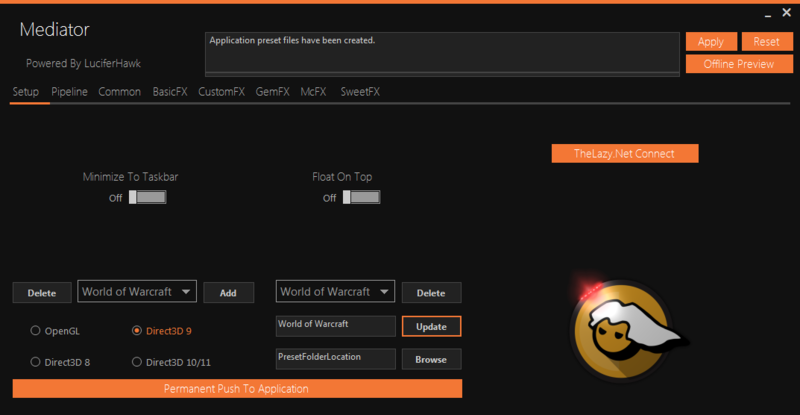 No game overlays or anything like that, unless you count the Battle.net launcher (I've actually launched WoW-64.exe outside of the Battle.net launcher and it still gives me the error I've provided). 17/01/2016 13:03:23:697  | INFO | > Delayed. 17/01/2016 13:03:23:698  | INFO | > Delayed. 17/01/2016 13:03:23:698  | INFO | > Libraries loaded. 17/01/2016 13:03:23:776  | INFO | > Installed 6 hook(s). 17/01/2016 13:03:23:777  | INFO | > Delayed. 17/01/2016 13:03:23:777  | INFO | > Libraries loaded. 17/01/2016 13:03:23:848  | INFO | > Installed 5 hook(s). 17/01/2016 13:03:23:848  | INFO | > Libraries loaded. 17/01/2016 13:03:23:951  | INFO | > Installed 8 hook(s). 17/01/2016 13:03:23:951  | INFO | Initialized. 17/01/2016 13:03:28:648  | INFO | > Installed 360 hook(s). 17/01/2016 13:03:28:663  | INFO | > Installed 9 hook(s). 17/01/2016 13:03:28:669  | INFO | > Adding 'CS_OWNDC' window class style flag to 'N_OVERLAY'. 17/01/2016 13:03:31:084  | INFO | > Installed 2 hook(s). I could be mistaken, but isn't WoW DX11 these days? Could well be worth setting the profile in the mediator to use that, instead. I actually did try and set the Mediator to DX11 and setting WoW to that too. Strangely enough, when I launch WoW, it appears for a moment in my Task Manager and just disappears. No error. Just closes after a moment. I turned off EVGA Precision and managed to run the game normally with Reshade, BUT without the EVGA Precision, my GPU heats up A LOT! Last Edit: 2 years 11 months ago by WalterDasTrevas.